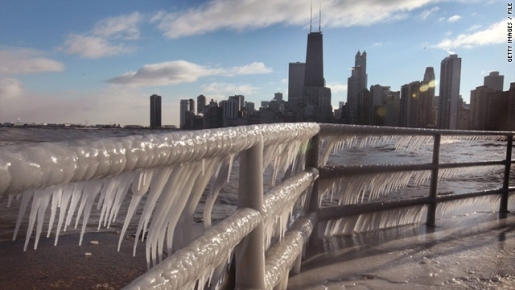 The Windy City, Chicago, Illinois, is no stranger to snow, but an upcoming weather event may be the most brutal storm of the season for the American midwest, and may well end up being one of the most dangerous blizzards in Chicago history. Thanks to an unusual combination of freezing weather from Canada and hot, moist air from Texas, an epic blizzard is forming over most of the midwest. Chicago and other major cities stretching from Oklahoma City, Oklahoma, to Caribou, Maine, are facing severe winter storms. This storm will dwarf New York’s Christmas blizzard. The Texas panhandle will be in the single digits. Up to 100 million people will be affected by the snow, ice, and terrible weather. Twenty US states fall under winter weather advisories, from New Mexico to New Jersey and every state in between. In some areas, temperatures will be 50 degrees below normal! Yeesh; be careful out there, America, and stay OFF the roads.